Postoperative wound infection of the spine maliciously increases the morbidity, mortality, and health-care costs of the patient. Despite the currently available antibiotics, advances in surgical techniques and postoperative care, postoperative deep wound infection significantly compromises the outcome of spinal surgeries. The largest contributing factor being the long duration of operations, increasing number of spine surgeries on elderly as well as immunocompromised patients, and the growth in availability and prevalence of spinal instrumentation in recent times. A thorough clinical examination, use of advanced imaging techniques and their careful evaluation can lead to early diagnosis. A radiologist equipped with modern imaging techniques can aid in differentiating between normal postoperative changes and early infection. Infection due to an involvement of various pathogens, commonly a single or less frequently of the polybacterial type is often seen postoperatively. Gram-positive, Gram-negative bacteria, mycobacteria, and rarely fungal infections may be responsible for postoperative spinal infection and spondylodiscitis, more so in immunocompromised patients. The organisms that predominate in these infections are Staphylococcus aureus, Staphylococcus epidermidis, and Enterococcus sp. Gram-negative organisms that can be encountered are Pseudomonas aeruginosa, Escherichia More Details coli, and Proteus species. Gram-negative organisms are more likely to occur in lower lumbar surgical interventions. Anaerobic microorganisms such as Propionibacterium acnes ( P.acnes ), part of the normal skin flora, have been increasingly reported to cause various orthopedic related surgical site infections including spine surgeries. P. acnes are difficult to detect in patients undergoing spinal surgery with instrumentation. Radiographs, multidetector computed tomography (MDCT), radionuclide bone scans, and magnetic resonance imaging (MRI) have all been used for imaging the postoperative spine. MRI is widely used because it allows adequate visualization of both the bony structures and soft tissues. It can also directly visualize the spinal cord and the lumbosacral/brachial plexuses. Metallic orthopedic hardware may produce artifacts that degrade image quality. A metal artifact reduction sequence (MARS) has been developed to optimize image quality in bone and soft tissues and is used routinely with many pulse sequences. Iterative decomposition of water and fat with echo asymmetry and least-squares estimation (IDEAL) is a novel imaging technique for separating fat and water and reducing susceptibility artifacts due to metal hardware. The most sensitive modality to detect infections, with the sensitivity of 93% and specificity of 97% for early detection is MRI as it allows better definition of paravertebral and epidural spaces and allows assessment of neural compression elements. With the option of diffusion-weighted sequences, diffusion-weighted MRI can differentiate between pyogenic, tubercular,, and fungal discitis by their apparent diffusion coefficient (ADC) value profile. 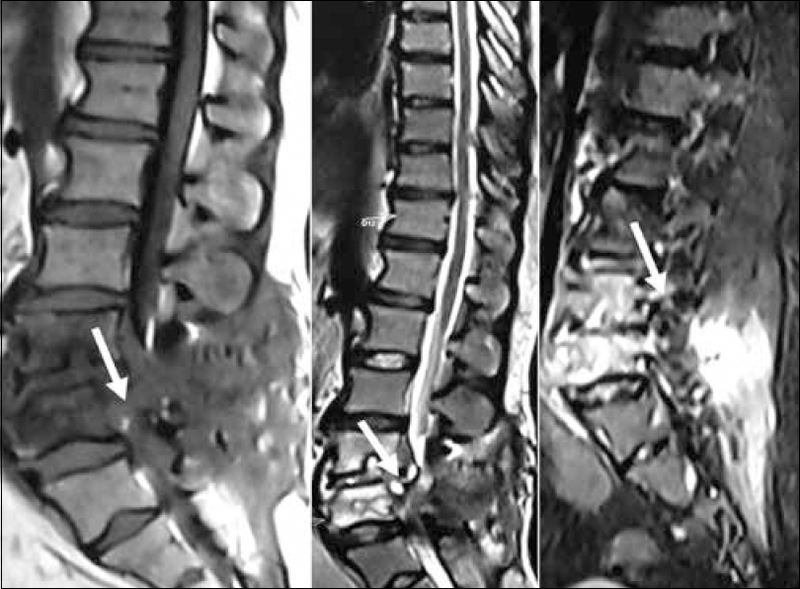 This article illustrates the imaging features of spinal infection on multiple imaging modalities as a common postoperative complication associated with various surgical and instrumentation techniques. Postoperative spinal infection can be either superficial or deep. It can result in abscess formation in the paravertebral muscles or the epidural space, such as meningitis or arachnoiditis as well as present as spondylodiscitis. Failure of fusion secondary to infection may place stress on the instrumentation. Continuous motion of the surgical site results in hardware failure, loosening, displacement, or deformation. Malpositioning (of pedicular screws, bone grafts, cages, and plates) are the most common postoperative complications encountered. The other complications may range from hematomas and fluid collections in the surgical bed, recurrent disk herniation and epidural scar formation. Plain radiographs usually show no specific changes in first 3 weeks of a spinal infection. Later, in the course of the disease, after 4–6 weeks they may show lytic destruction, disc space narrowing, and foci of sclerosis with paravertebral soft-tissue collections or abscesses. Hence, plain radiographs have a role in the inspection and monitoring of implants and their complications. For example, lysis around the implants called as periprosthetic osteolysis suggestive of loosening [Figure 1]. It is a cost effective, easily available imaging. The spinal instrumentation and the alignment assessment is better appreciated. Implant loosening is not visible in early stages. Computed tomography (CT) is the examination of choice for the assessment of the bony structures of the spine. Assessment of the soft-tissue structures of the spine is often limited and augmentation with contrast medium administration can be indicated. CT is fast and well-tolerated by most patients. CT scans show areas of early bony destruction and soft-tissue collections with better anatomical detail than plain radiographs. Early changes include end plate erosions followed by lytic destruction of the vertebral bodies [Figure 2]. MDCT plays a role in tissue characterization by providing guidance for tissue biopsy of discitis or vertebral osteomyelitis, by fine-needle aspiration and cytology, and aspiration of pus from abscess cavities to provide a microbiological diagnosis including culture for identifying the organism and its antibiotic sensitivity before therapy. 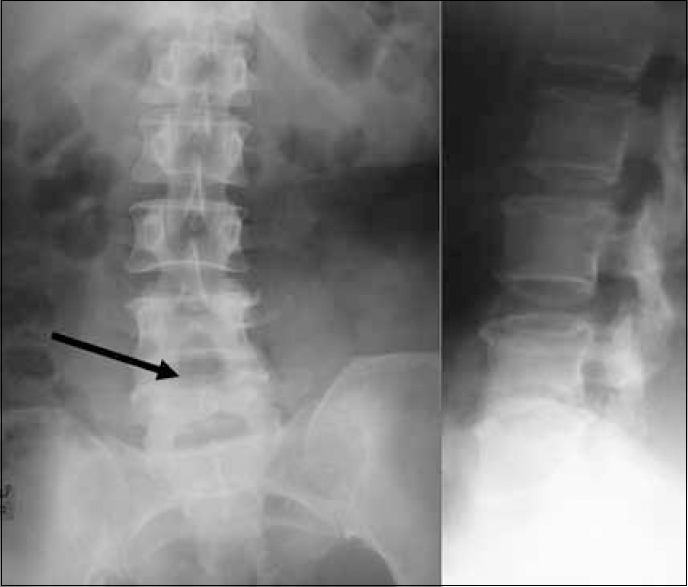 Conventional radiography may take up to 8 weeks to show changes of spondylodiscitis  compared to CT which may be positive after 3–4 weeks and shows bone destruction and endplate erosions, disc hypodensity, and flattening with soft-tissue changes such as loss of normal pre and para vertebral fat planes. Patients with pacemakers and aneurysmal clips and neurostimulators, cochlear implants who are otherwise contraindicated for MRI examination benefit from MDCT. Metallic artifacts degrade image quality especially stainless steel instrumentation. Bone scintigraphy is easily available, easily performed and rapidly completed but is not specific. Majority of instances of spinal infections show increased uptake of radiopharmaceutical [Figure 4]. In patients who have pacemakers, metallic cardiac valves, aneurysmal clips, and neurostimulators and cochlear implants where MRI is contraindicated. CT scans are helpful in patients with spinal instrumentation, where loosening and infection coexist. Three-phase bone scintigraphy with single photon emission CT (SPECT) and analysis of uptake patterns could enhance the accuracy of the 99mTc-methylene diphosphonate (MDP) scan. Three-phase bone scintigraphy is performed with technetium-99m labeled diphosphonates (MDP) using a SPECT Gamma camera, the uptake depending on blood flow, new bone formation rate. The three-phase bone scan consists of the flow or perfusion phase, (acquired immediately after tracer injection), followed immediately by the blood pool or soft tissue phase and then bone phase consists of images acquired 2–4 h later. The classic appearance of spinal osteomyelitis is focal hyperperfusion, focal hyperemia on blood pool phase, and focal bone uptake on third bone uptake phase [Figure 4]. For diagnosing osteomyelitis in bones not affected by underlying conditions. Abnormalities on bone scans reflect the rate of new bone formation in general and not infection specifically; hence, false positives occur as tumors, fractures, orthopedic hardware, and the neuropathic joint can all result in a positive three-phase bone scan in the absence of infection, hence, lacks specificity. F-18 often identifies the presence of a postoperative disk space infection earlier than technetium-99m scans or plain films [Figure 6]. Other tracers for diagnosing spinal infection are being developed including radio labeled antibiotics, such as ciprofloxacin, streptavidin/indium-111-biotin complex, and radiolabeled antifungal tracers, which offer to differentiate between fungal and bacterial infection. FDG-PET images are not affected by metallic implant artifacts and have a distinctly higher spatial resolution than images obtained with single photon emitting tracer like technetium 99 [Figure 7]. Gallium-67-C imaging plays a role as an adjunct to conventional bone scan for a better specificity of the study and to highlight extraskeletal sites of infection. F-18/FDG PET is superior to MRI not only in patients with surgical history and high grade infection but also in a patient with low-grade spondylodiscitis . In fact, studies prove that F-18/FDG-PET/CT shows superior diagnostic value in the early course of spondylodiscitis when compared to MRI. After 2 weeks of symptoms, both modalities have similar yield. MRI showed the highest sensitivity in diagnosing epidural and spinal abscesses [Figure 8]. FDG-PET appears to be the study of choice when chronic osteomyelitis is suspected to ascertain the status of the disease activity. Nonspecific. It cannot differentiate between pyogenic, tubercular, fungal infections, and neoplasia from each other unless registered with CT or MRI. MRI plays a pivotal role in imaging of patients with spinal instrumentation. However, magnetic susceptibility artifacts from metallic devices pose problems in the form of degrading image quality due to artifacts. Titanium implants produce fewer artifacts with better image quality [Figure 9]. Incomplete fat saturation represents an additional challenge in evaluating the postoperative spine with metallic hardware. Many techniques are available to minimize susceptibility artifacts, for example, MARS (metal artifact suppression technique) and IDEAL [Figure 10] and [Figure 11]. IDEAL water fat separation technique achieves uniform fat saturation and counters the effects of field inhomogeneity while maintaining high signal to noise ratio. MRI findings suggestive of post procedural discitis include a decreased signal on T1 and an increased signal on T2-weighted images in the disk space, secondary to edema from the inflammation and infection (Mimic Modic I pattern) [Figure 13]. 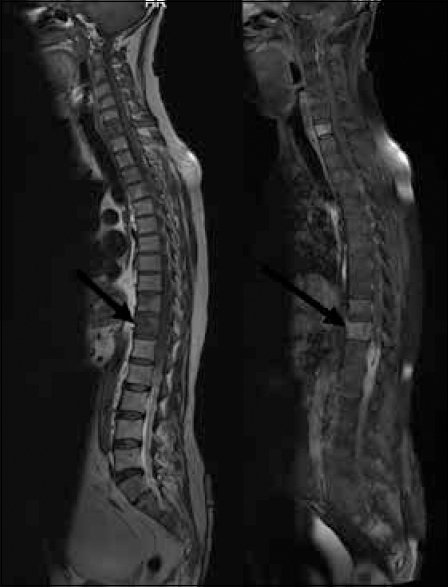 Discal and paraspinal tissue contrast enhancement on fat-suppressed T1 postcontrast MRI sequences is suggestive of infection even in the absence of Modic's Type I end plate changes [Figure 14]. 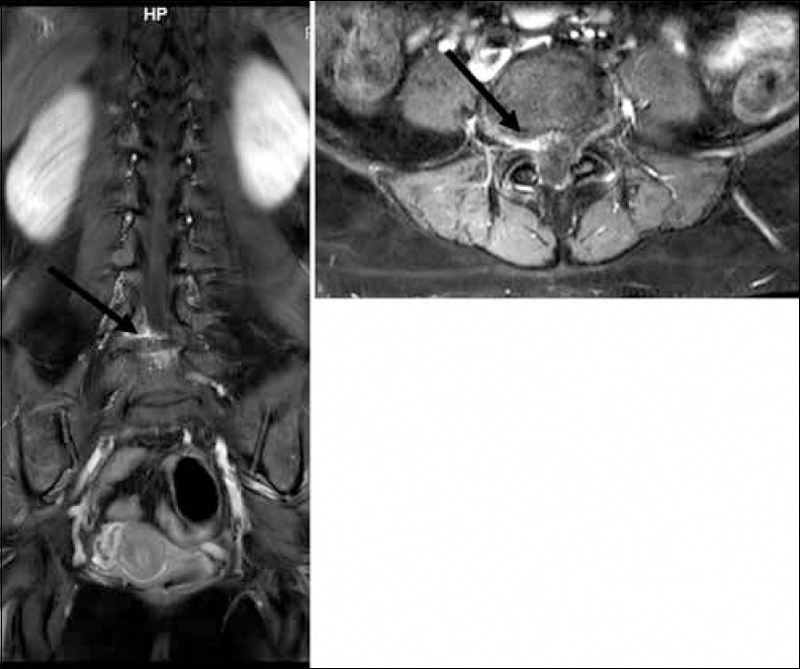 An epidural abscess is usually an isointense lesion with the cord or cauda equina on T1-weighted images with T2 and short tau inversion recovery sequence (STIR) hyperintensity with mass effect on the cord and thecal sac [Figure 14]. Gadolinium-enhanced T1-weighted images show rim enhancement of the abscess wall with a necrotic nonenhancing matrix) [Figure 15] and [Table 1]. MRI is the imaging modality of choice due to very high sensitivity and specificity. It is also useful in differentiating between pyogenic infection, tuberculous, and fungal infections or a neoplastic process. In postoperative cases without spinal instrumentation, MRI is the best imaging modality of choice  [Figure 15] and [Figure 16]. Hypointense signal in the discs and end plates (fluid and bone marrow edema). High signal in paravertebral soft tissues on T2 more pronounced on fat-suppressed sequences such as STIR [Figure 17]. Ring-like enhancement around low-intense centre indicates central necrosis or liquefaction due to abscess formation. Postcontrast study is ideal to differentiate between inflammatory phlegmon from abscess  [Figure 19] and [Figure 20]. Diffusion-weighted imaging (DWI) is useful only in postoperative patients without instrumentation [Figure 21]. DWI can show variable foci of restrictive diffusion seen as partially hyper and hypointense signal on ADC maps associated with high and low ADC values. The high ADC component may represent more serous fluid in caseated necrotic focus in a tuberculous abscess and relatively low ADC represents a secondary liquefaction with low viscosity pus. This is in contrary to viscous pus formation due to frank liquefaction in pyogenic abscesses  [Figure 16] and [Figure 21]. 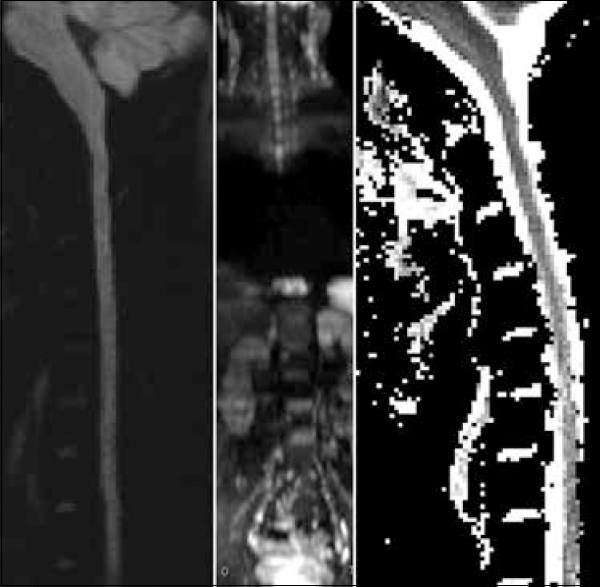 Spinal instrumentation interferes with image quality in diffusion weighted MRI which can be partially compensated by the use of special artifact reduction techniques. MRI is shown to have the highest sensitivity and specificity in the diagnosis of postprocedural discitis. Use of MARS technique or IDEAL techniques to reduce artifacts if spinal instrumentation is present. Diffusion MRI: special optional if no spinal instrumentation is present: spinal diffusion with b values of 0, 800 or 1000 using spin echo EPI sequences with ADC maps. Contrast study is contraindicated during pregnancy. 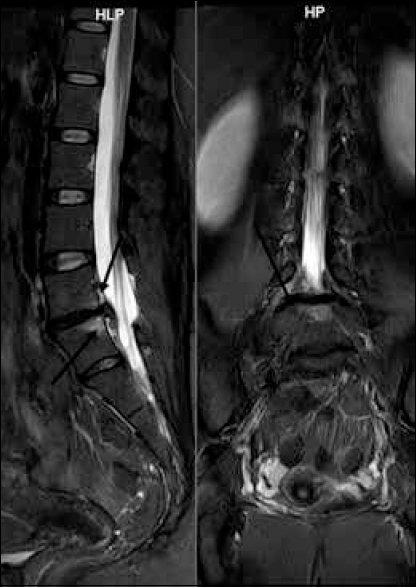 The diagnostic challenges in postoperative spinal infection include spinal instrumentation and use of optimized imaging protocols and the choice of imaging technique as each technique suffers from inherent merits and demerits. A multimodality imaging approach using MRI with pre and post contrast sequences including diffusion-weighted MRI sequence coupled with metal artifact reduction technique and nuclear medicine imaging such as F-18 bone scan and Tc99 scintigraphy enhance the early detection of infection and its extent accurately. A high index of suspicion and experienced radiologist using modern imaging techniques can help the surgeon in arriving at an early diagnosis. Microbiological and histopathological studies and use of appropriate antibiotics with or without surgical debridement also aid to achieve the satisfactory result. Close cooperation between the treating surgeon and radiologist would go a long way in alleviating the suffering of the patient. Jackson AB, Dijkers M, Devivo MJ, Poczatek RB. A demographic profile of new traumatic spinal cord injuries: Change and stability over 30 years. Arch Phys Med Rehabil 2004;85:1740-8. Parchi PD, Evangelisti G, Andreani L, Girardi F, Darren L, Sama A, et al. Postoperative spine infections. Orthop Rev (Pavia) 2015;7:5900. Yu L, Liu X, Leng S, Kofler JM, Ramirez-Giraldo JC, Qu M, et al. Radiation dose reduction in computed tomography: Techniques and future perspective. Imaging Med 2009;1:65-84. Olsen RV, Munk PL, Lee MJ, Janzen DL, MacKay AL, Xiang QS, et al. Metal artifact reduction sequence: Early clinical applications. Radiographics 2000;20:699-712. Bertagna F, Pizzocaro C, Biasiotto G, Giubbini R, Werner T, Alavi A, et al. 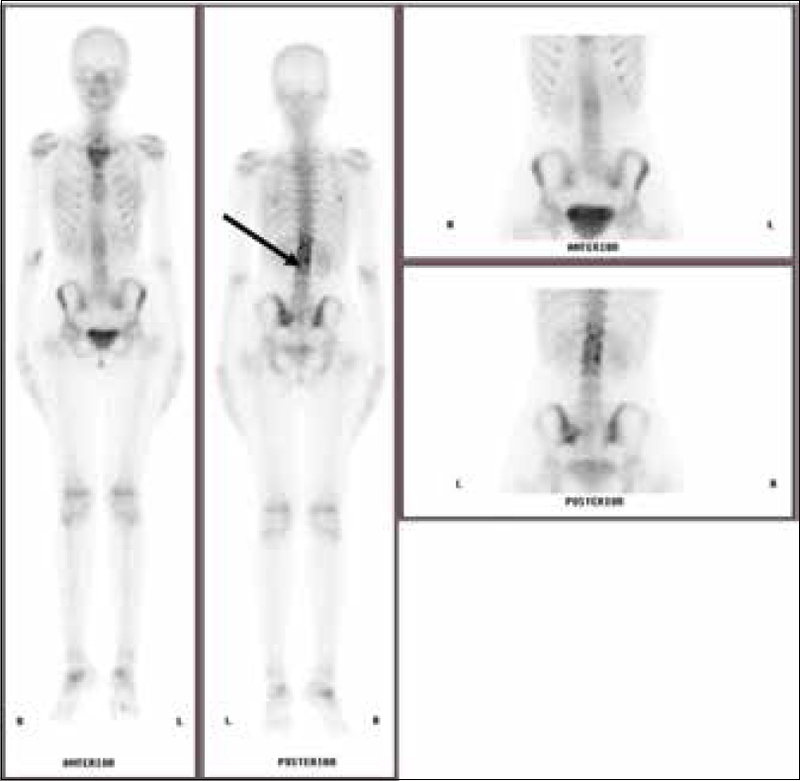 (18) F-FDG-PET/CT findings in patients affected by spondylodiscitis. Hell J Nucl Med 2010;13:166-8. Kim SY, Hong SJ, Lee CY, Chung KB, Park CM. 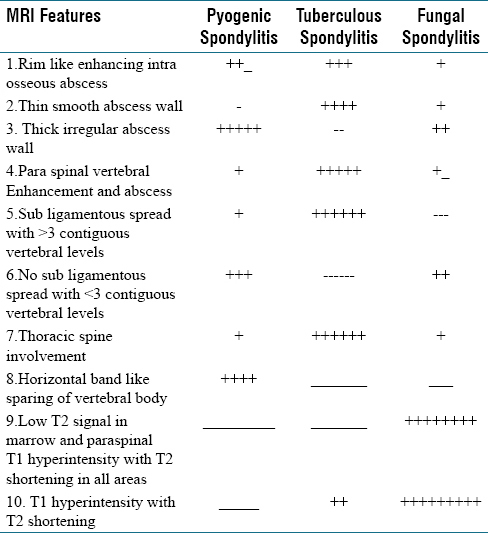 Tuberculous spondylitis vs. pyogenic spondylitis: Focusing on the discriminative MR findings for differentiation. J Korean Radiol Soc 2007;56:183-9. Moritani T, Kim J, Capizzano AA, Kirby P, Kademian J, Sato Y, et al. Pyogenic and non-pyogenic spinal infections: Emphasis on diffusion-weighted imaging for the detection of abscesses and pus collections. Br J Radiol 2014;87:20140011. Hayashi D, Roemer FW, Mian A, Gharaibeh M, Müller B, Guermazi A, et al. Imaging features of postoperative complications after spinal surgery and instrumentation. AJR Am J Roentgenol 2012;199:W123-9. Mohi Eldin MM, Ali AM. Lumbar transpedicular implant failure: A clinical and surgical challenge and its radiological assessment. Asian Spine J 2014;8:281-97. Shau DN, Bible JE, Samade R, Gadomski SP, Mushtaq B, Wallace A, et al. Utility of postoperative radiographs for cervical spine fusion: A comprehensive evaluation of operative technique, surgical indication, and duration since surgery. Spine (Phila Pa 1976) 2012;37:1994-2000. Sehn JK, Gilula LA. Percutaneous needle biopsy in diagnosis and identification of causative organisms in cases of suspected vertebral osteomyelitis. Eur J Radiol 2012;81:940-6. Teplick JG, Haskin ME. 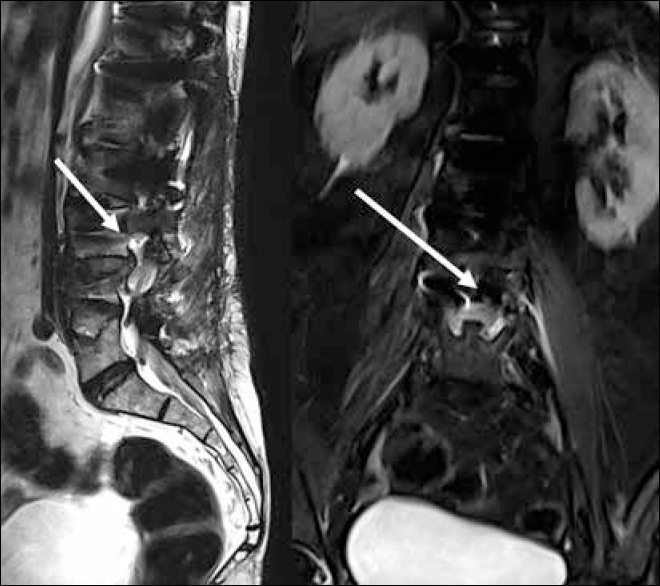 Intravenous contrast-enhanced CT of the postoperative lumbar spine: Improved identification of recurrent disk herniation, scar, arachnoiditis, and diskitis. AJR Am J Roentgenol 1984;143:845-55. Saha S, Burke C, Desai A, Vijayanathan S, Gnanasegaran G. SPECT-CT: Applications in musculoskeletal radiology. Br J Radiol 2013;86:20120519. Love C, Tomas MB, Tronco GG, Palestro CJ. Imaging infection and inflammation with 18FFDG-PET. Radiographics 2005;25:1357-68. Schmitz A, Risse JH, Textor J, Zander D, Biersack HJ, Schmitt O, et al. FDG-PET findings of vertebral compression fractures in osteoporosis: Preliminary results. Osteoporos Int 2002;13:755-61. Pouldar D, Bakshian S, Matthews R, Rao V, Manzano M, Dardashti S, et al. Utility of 18F sodium fluoride PET/CT imaging in the evaluation of postoperative pain following surgical spine fusion. Musculoskelet Surg 2017;101:159-66. Gemmel F, Dumarey N, Palestro CJ. Radionuclide imaging of spinal infections. Eur J Nucl Med Mol Imaging 2006;33:1226-37. Tamm AS, Abele JT. Bone and gallium single-photon emission computed tomography-computed tomography is equivalent to magnetic resonance imaging in the diagnosis of infectious spondylodiscitis: A retrospective study. Can Assoc Radiol J 2017;68:41-6. Gemmel F, Rijk PC, Collins JM, Parlevliet T, Stumpe KD, Palestro CJ, et al. 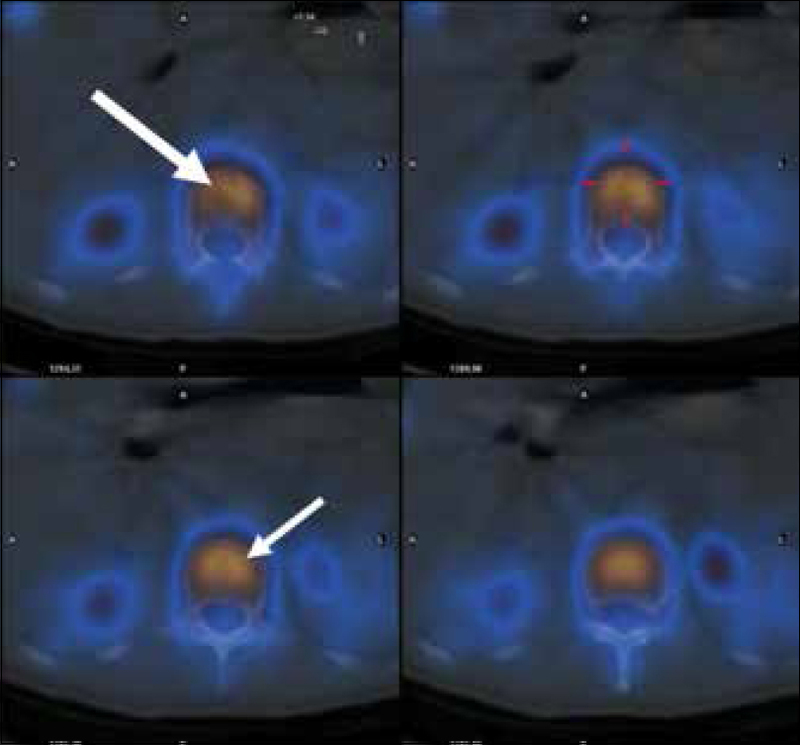 Expanding role of 18F-fluoro-D-deoxyglucose PET and PET/CT in spinal infections. Eur Spine J 2010;19:540-51. Smids C, Kouijzer IJ, Vos FJ, Sprong T, Hosman AJ, de Rooy JW, et al. A comparison of the diagnostic value of MRI and 18F-FDG-PET/CT in suspected spondylodiscitis. Infection 2017;45:41-9. Pineda C, Espinosa R, Pena A. Radiographic imaging in osteomyelitis: The role of plain radiography, computed tomography, ultrasonography, magnetic resonance imaging, and scintigraphy. Semin Plast Surg 2009;23:80-9. Yu H, Reeder SB, McKenzie CA, Brau AC, Shimakawa A, Brittain JH, et al. Single acquisition water-fat separation: Feasibility study for dynamic imaging. Magn Reson Med 2006;55:413-22. Talbot BS, Weinberg EP. MR imaging with metal-suppression sequences for evaluation of total joint arthroplasty. Radiographics 2016;36:209-25. Cha JG, Jin W, Lee MH, Kim DH, Park JS, Shin WH, et al. Reducing metallic artifacts in postoperative spinal imaging: Usefulness of IDEAL contrast-enhanced T1- and T2-weighted MR imaging – Phantom and clinical studies. Radiology 2011;259:885-93. Modic MT, Feiglin DH, Piraino DW, Boumphrey F, Weinstein MA, Duchesneau PM, et al. Vertebral osteomyelitis: Assessment using MR. Radiology 1985;157:157-66. Van Goethem JW, Parizel PM, van den Hauwe L, Van de Kelft E, Verlooy J, De Schepper AM, et al. The value of MRI in the diagnosis of postoperative spondylodiscitis. Neuroradiology 2000;42:580-5. Lindner A, Warmuth-Metz M, Becker G, Toyka VV. Iatrogenic spinal epidural abscesses: Early diagnosis essential for good outcome. Eur J Med Res 1997;2:201-5. Jung NY, Jee WH, Ha KY, Park CK, Byun JY. 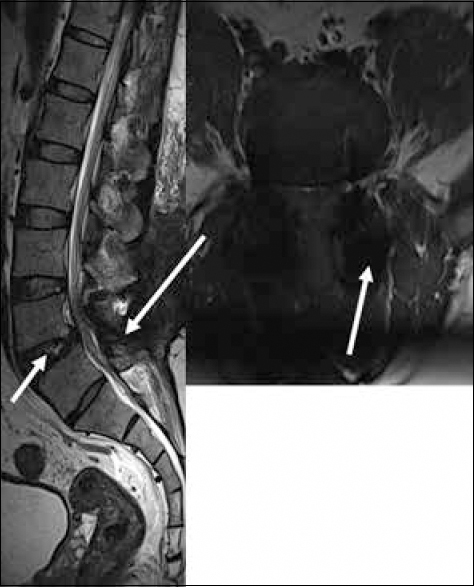 Discrimination of tuberculous spondylitis from pyogenic spondylitis on MRI. AJR Am J Roentgenol 2004;182:1405-10. Lee SW, Lee SH, Chung HW, Kim MJ, Seo MJ, Shin MJ, et al. 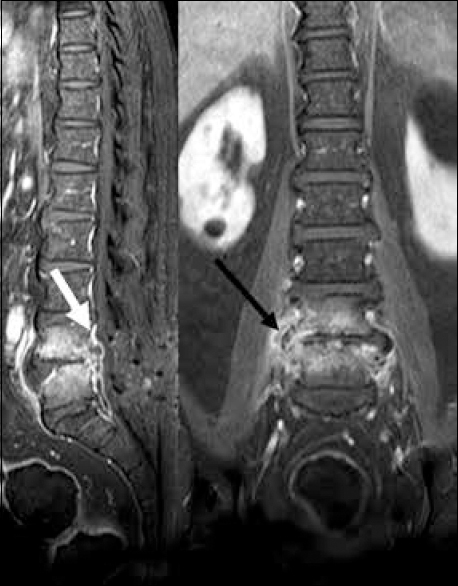 Candida spondylitis: Comparison of MRI findings with bacterial and tuberculous causes. AJR Am J Roentgenol 2013;201:872-7.